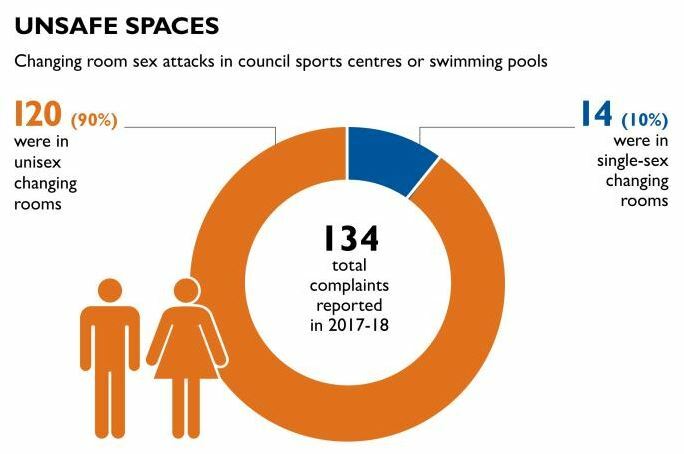 Most sexual assaults at public swimming pools happen in unisex changing rooms, figures reveal. Ninety per cent of assault, voyeurism and harassment cases relate to the gender neutral zones which have been branded a ‘magnet’ for sexual predators. Of 134 complaints in the UK last year, 120 are about incidents in unisex changing rooms, data obtained by the Sunday Times revealed. The stats compound fears that unisex changing rooms – which are becoming increasingly popular to accommodate transgender people – pose a danger to women.